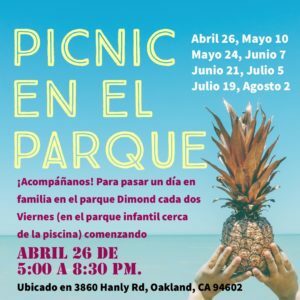 We are very excited to announce Glenview’s Picnic in the Park. 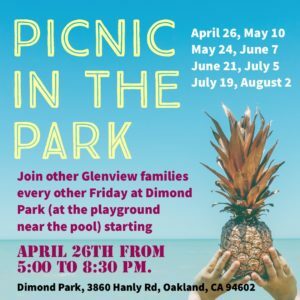 Join other Glenview families at Dimond Park on Friday evenings, every other week, starting on Friday, April 26, from 5pm to 8:30pm. This is an informal gathering for all our Glenview families to see old friends and meet new ones. We will be hosting this event every other Friday through the summer. Bring your family, food (something to share if you like) and stuff to play with like balls, frisbees, and bikes. We look forward to seeing you there! Meet near the playground by the pool. Contact Cynthia Nova (mom to Joaquin Mitchell in TK) at novamitchell100@gmail.com if you have any questions.